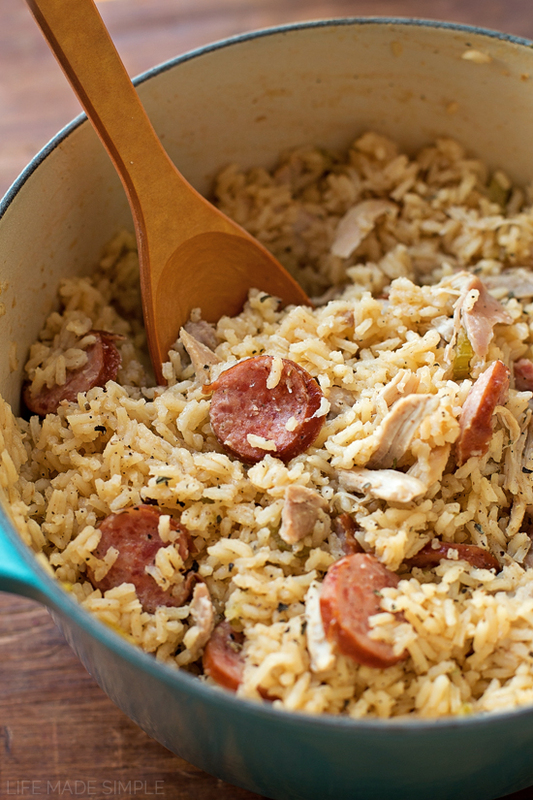 Chicken bog is a pilaf-style dish made of rice, chicken, onion, spices, and sausage. 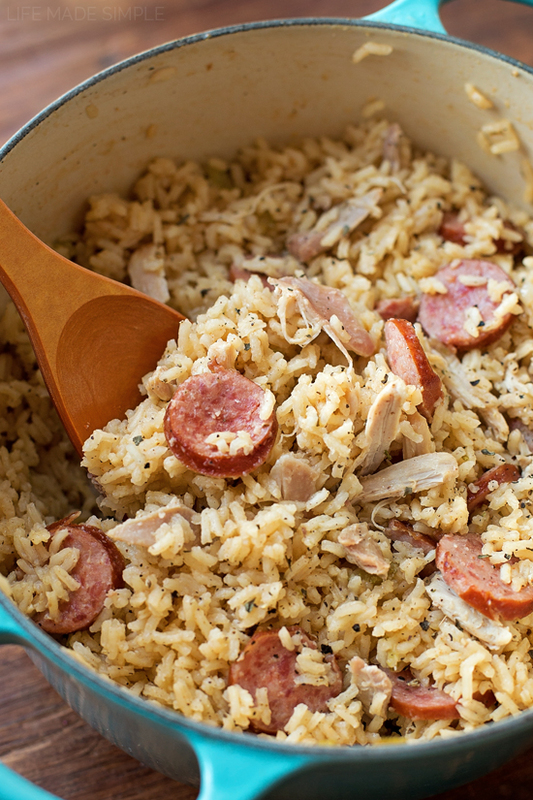 This quick and easy 1-pot meal is sure to become a family favorite! I wasn’t really intending on sharing this dish when I made it, but I’m so glad I snapped a few pictures before we devoured it, because it was SOOO good! 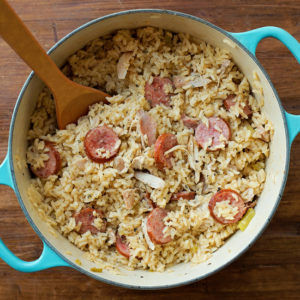 This is chicken and rice (and sausage) taken to a whole new level- it’s flavorful, filling and just happens to be made in one pot! When I first stumbled upon a recipe for Carolina chicken bog, I wasn’t really sure what to expect, but I figured our family would like it. 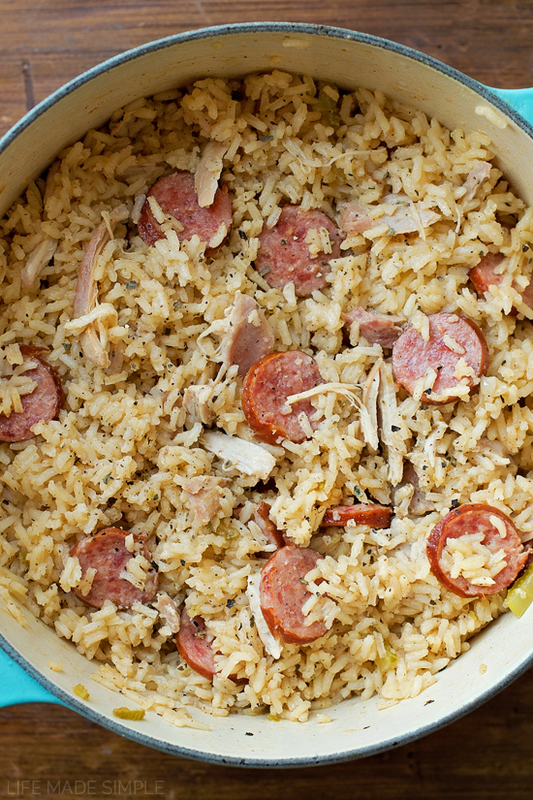 It’s basically rice, chicken and sausage. You can’t go wrong with a combo like that. My version isn’t super traditional, but it is pretty darn delicious. What I really loved about this dish was the method in which it’s cooked. You render the fat from the chicken thighs, then saute the veggies in it, then pour in the broth and cook the chicken, rice and sausage in it. The flavor is incredible (although a few bay leaves, some Italian seasoning, salt, pepper, garlic and paprika help attribute to that too). Plus I felt like there wasn’t a whole lot of work that went into shopping/prepping/making this one-pot meal. 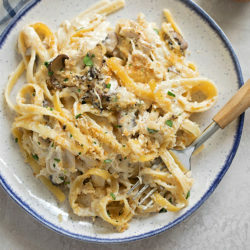 I’m ALWAYS a big fan when dinner is easy on the wallet, takes less than an hour to get it on the table, tastes amazing and leaves us with some leftovers for the following day. This chicken bog is definitely going to be something we make over & over again. It was gobbled up by everyone and there were zero complaints about it! That’s kind of a big deal!! I hope you’ll give this one-pot meal a try, it’s cozy, comforting and perfect for busy weeknights! In a large pot or Dutch oven set over medium heat, melt butter. Cook thighs, skin side down until browned, about 7-9 minutes (the chicken will not be fully cooked). Transfer to a plate and discard the skin. Add the sausage, celery and onion and cook until browned, about 5 minutes. Add the garlic and cook until fragrant, about 30 seconds. Pour in the chicken broth. Add the chicken thighs along with the paprika, salt, pepper, Italian seasoning, garlic powder, and bay leaves. Turn the heat up to medium-high and bring the mixture to a boil. Reduce heat and allow to simmer for 20 minutes. Remove the thighs from the pot along with the bay leaves. Pour the rice into the simmering mixture, cover and cook for about 20 minutes or until the rice is tender. Meanwhile, pull the chicken from the bone and shred. Return the chicken to the pot, stir to combine. Cover, remove from the heat and allow to sit for 5 minutes before serving. -This is not a traditional recipe, however it does incorporate traditional elements. I’ve made this several times! It’s a huge hit at our house! We like to add mushrooms or shrimp sometimes too!! Thank you for a family favorite!! Yum! Mushrooms would be excellent! I have my own, but gonna try yours next week. Gotta office/ warehouse cookout scheduled. Thanks David- I hope it’s a hit! A tablespoon sized garnish of corn chow chow as a garnish or side really kicks up the flavors and adds a zing! I made this for dinner last night. Delicious! I’m making it now and so nervous. I have a quick question. Do you simmer the rice down until there is no more broth? This is my first time making chicken bog ever!! I’ve eaten it plenty of times, but this recipe is AMAZING!!!! I am so very proud of myself. Whoop whoop!!! Thank you so much for this! It was exactly what I wanted it to be!! I’m confused…you are cooking the chicken in a stock pot/ large pot..like it’s a frying pan or are u boiling it? Any suggestions for doing this in an instant pot? Small bag of saffron rice along with uncle bens white rice is what we do in our neck of the woods. South eastern N.C. if you can get a old hen or one from the back yard sometime. It’s worth it. We use penders smoked sausage also. 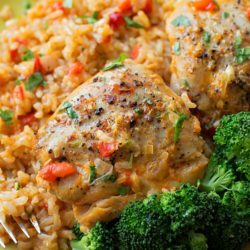 This is one of the best chicken bog recipes I have ever cooked. The flavors are so unique and blend together with great flavors. Very easy to make and just delicious! I live in SC where the chicken bog was born and this is a welcome new flavor from the traditional recipe. Highly recommended that you try this one for sure! Well deserved for the rating of Five stars. Thanks Brenda! That’s such a huge compliment!! This looks absolutely delicious. I love chicken big. I have never made myself. I am going to cook this for Sunday dinner. Will let you know how it went! Yep, really good stuff. We use rabbit meat too in place of chicken. Oh man I’m so excited to make this tonight after reading the comments!! Thanks for the kind comment David! I’m so happy that the bog was a hit! I rarely reply or rate but I had to for this recipe. This was so good! I used boneless chicken thighs and omitted the celery. I converted it to an instant pot recipe by using the saute feature for the chicken, onion and sausage. I used the manual setting for 3 minutes after the rice was added. Delicious! This dish is Southern staple. We have a festival each year in LORIS SC…The Lori’s BogOff, it is a cook off for Bog lovers. Something to check out. You get out of Horry County, people have no idea what it is.Thanks for drawing attention to our favorite dish! Best served with dinner rolls, bread n butter picked and a nice slice of Humming bird cake. . Y’all be good! Thank you Steven. It’s such a wonderful dish, isn’t it? Made it. Loved it. Added 1/2 tsp Hungarian paprika for spice. Big hit with family and was better the next day. This may sound like a silly question but exactly what kind of white rice do you use? Long grain, short grain, etc. I always have trouble cooking rice for some reason mine always turns out mushy not separated and flaky. Hi Dana, great question. My favorite brand is Rice Select. I can find it at almost every grocery store. I alternate between their Jasmati and Texmati, both of which are long grain. Rinsing the rice in water and toasting it beforehand can help eliminate the mushy texture. They also have another variety call Kasmati which is suppose to be a much firmer grain (and gets less mushy when cooking). I totally know how you feel though, I struggled for a long time to master rice. You are so very welcome Sharelle. Thanks for stopping by!